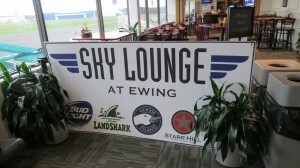 Welcome to the Sky Lounge at Ewing, where our goal is to provide a quick and easy dining experience designed for you, the airport traveler. Our goal is to take away the normal stress of dining in an airport by providing a simple menu with a variety of options, attentive service, quality food, and a wide selection of alcoholic and non-alcoholic beverages. All this for considerably less than normal airport prices. So please allow yourself a little time before you fly to stop by the Sky Lounge and enjoy the atmosphere, the food, and the spirits. * The restaurant and concession area will be open for all departing flights and will extend business hours for delays.